A Burlington Artist Sets Up a Homey Performance Piece — in Her "Parlor"
But Garcia, a Burlington artist and spouse of fellow artist Clark Derbes, has decided to embrace the married moniker for an upcoming performance-art project she’s calling “Mrs. Derbes Is Home.” Every Sunday from April 7 through June 16, she will hold “old-school visiting hours in a modern way.” That is, Garcia will hand out calling cards — which she’ll make by hand — to individuals she may encounter during the week, inviting them to stop in to her “living room/parlor” between two and four o’clock on Sunday. 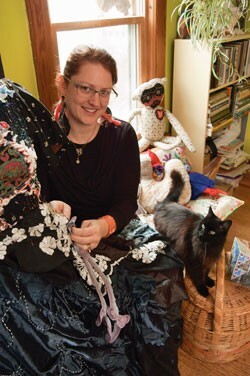 An artist who works primarily with fabric, she says she’ll probably embroider or sew while chatting with guests, and will offer tea and cookies. Known for her fabulous dresses, the artist last year completed a project called “The Dress That Makes the Woman.” She wore a single frock each month for a year, constantly altering and adding to each one. Garcia kept a blog, with photos, about the process and noted how, as she changed the costume, it also changed her.